Aubrey Hord Photography: AHP image is used on iPhone application! Exciting news from Aubrey Hord Photography and Accuterra for iPhone. 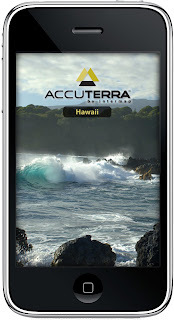 If you have the mapping app AccuTerra for iPhone, you most likely will see this image of Hawaii when you open the mapping program for the state of Hawaii. It covers all the islands at a USGS 7.5 ‘ level. The image is a “splash screen” that is displayed every time the app launches. The photo is from the Keanae pennisula on the road to Hana. I received full rights to use this image on the blog from Intermap, of course.